Following the departure of the Minnesota North Stars after the 1993 season, the state of Minnesota was without an NHL team for seven seasons. Saint Paul mayor (and future U.S. Senator) Norm Coleman began a campaign to either recruit the relocation of an existing franchise to the city or the award of an expansion franchise to a Minnesota-based ownership group. These efforts came close to success in the mid-1990s when Minnesota interests purchased the original Winnipeg Jets with the intention of relocating the franchise to Minnesota; however, arena negotiations fell through and the Jets instead relocated to Phoenix, Arizona. Shortly after the failed attempt to relocate the Jets, the NHL announced its intention to expand from 26 to 30 teams. Businessman and Minnetonka native Bob Naegele, Jr. became the lead investor for an application to the NHL for an expansion franchise and ultimately the first majority owner. On June 25, 1997, the National Hockey League (NHL) announced that Minnesota had been awarded an expansion franchise, to begin play in the 2000–01 season. The six finalist team names for the new NHL franchise (Blue Ox, Freeze, Northern Lights, Voyageurs, White Bears, and Wild), were announced on November 20, 1997. Jac Sperling was named chief executive officer of the Minnesota team, Doug Risebrough was named general manager, Tod Leiweke was named President, and Martha Fuller was named chief financial officer. The team was officially named the Wild, with the unveiling occurring at Aldrich Arena in the suburb of Maplewood on January 22, 1998. The new name was introduced to everyone with the song "Born to be Wild" by Steppenwolf playing over the arena's speaker system. The Minnesota Wild announced its first major sponsorship agreement with MasterCard from First USA. It was the earliest that First USA had ever signed an agreement in advance of a team beginning play (31 months). The State of Minnesota adopted legislation in April, 1998 to loan $65 million to the City of Saint Paul to fund 50% of the estimated $130 million project costs for the Xcel Energy Center in Saint Paul. The legislation also provided that only $48 million of the loan needed to be repaid if the team met the requirements to have an agreement in place during the term of the lease with the Minnesota Amateur Sports Commission. The City of Saint Paul issued an additional $65 million in bonds, with roughly 90% of the debt service on the bonds and the repayment of the state loan coming from scheduled rent and payment in lieu of taxes from the Minnesota Wild. Deconstruction of the Saint Paul Civic Center began soon thereafter and the Xcel Energy Center design was announced. A groundbreaking ceremony for the Xcel Energy Center was hosted in Saint Paul. The Wild named Jacques Lemaire their first-ever head coach and the team picked Marian Gaborik third overall in the first round of the 2000 NHL Entry Draft. Gaborik would go on to score the first ever goal for the Wild in their franchise debut on October 6 at Anaheim. The Wild played their first ever home game on October 11 against the Philadelphia Flyers and skated to a 3–3 tie. Minnesota native Darby Hendrickson scored the first-ever home goal for the Wild. The team was not very successful on the ice, but showed promise for future seasons. However, the most notable game of the year was the first visit of the Dallas Stars, who had formerly played in Minnesota as the Minnesota North Stars. The Wild rode an emotional sellout crowd of over 18,000 to a 6–0 shutout in Dallas' first regular season game in Minnesota since a neutral-site game in 1993. The season ended with Scott Pellerin as the leading scorer with 39 points while Wes Walz, Darby Hendrickson and Gaborik paced the team with 18 goals each. The Wild would get off to a strong start in the 2001–02 season by earning at least one point in their first seven games. However, the Wild would finish in last place again with a record of 26–35–12–6. En route, there were signs the Wild were improving, as second-year speedster Gaborik had a solid sophomore season with 30 goals, including an invite to the NHL YoungStars Game, and Andrew Brunette led the team in scoring with 69 points. Gaborik spent much of the 2002–03 season vying for the league scoring crown before slumping in the second half, and the Wild, in their first ever playoff appearance, made it all the way to the Western Conference Finals before being swept 4–0 by the Mighty Ducks of Anaheim. Previously, the Wild had beaten the favored and third-seeded Colorado Avalanche in the first round in seven games, coming back from a 3–1 series deficit and winning both Game 6 and 7 in overtime. Brunette scored the series clinching goal, the last ever on Patrick Roy. In the Western Conference semi-finals, the Wild beat the fourth-seeded Vancouver Canucks, again in seven games, and again after being down 3–1 in a series. In the process, the Wild became the first team in playoff history to capture a seven-game series twice after facing elimination during Game 5. When the 2003–04 season started, the Wild were short-handed with both Pascal Dupuis and Gaborik holding out. After struggling in the first month, the Wild finally got their two young star left-wingers signed, but both struggled to get back into game shape as the Wild struggled through much of November. In a deep hole, the Wild could not climb back into the playoffs, despite finishing the season strong, with wins in five of their last six games as they finished last in the competitive Northwest Division with a record of 30–29–20–3. Along the way, the Wild began to gear up for the future, trading away several of their older players who were a part of the franchise from the beginning, including Brad Bombardir and Jim Dowd. The 2004–05 season was canceled due to an NHL lockout. Former Wild player Sergei Zholtok died from a heart condition during a game in Europe. Zholtok died in the arms of Minnesotan and former Wild player Darby Hendrickson. In the 2005–06 season, the first season after the lockout, Minnesota finished in fifth and last place in the Northwest Division, eight points behind fourth-placed Vancouver Canucks. En route, Marian Gaborik set a new franchise record for goals in a season at 38, and Brian Rolston set a new highest point total by a Wild player in a season at 79. The goaltender controversy between Manny Fernandez and Dwayne Roloson ended when Roloson was traded to the Edmonton Oilers for a first round pick in the 2006 NHL Entry Draft. The Wild signed veteran free agents Kim Johnsson, Mark Parrish, Branko Radivojevic and Keith Carney. On the day of the NHL Entry Draft, they traded the 17th overall pick and prospect Patrick O'Sullivan to the Los Angeles Kings for veteran Slovak Pavol Demitra. Niklas Backstrom was the starting goalie for the Wild after previous starter Manny Fernandez sprained his knee on January 20. Fernandez played for the first time since the sprain on March 6 and was removed after allowing three goals in two periods in the Wild's 3–0 loss to the San Jose Sharks. 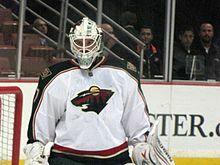 Josh Harding was brought up from the Wild's AHL affiliate, the Houston Aeros, when Fernandez was hurt, and remained on Minnesota's roster for the rest of the season as the backup goalie. All-Star winger Marian Gaborik returned from a groin injury in January 2007 and made an immediate impact, bringing a new spark to a lacking offense. The Wild would make the playoffs in 2007 for the second time in team history, but were eliminated by the eventual Stanley Cup champions Anaheim Ducks in the opening round. Notably, the same Anaheim franchise eliminated the Wild in their first playoff year, in the Conference Finals, in 2003. The Wild would break numerous franchise records during the 2007–08 season, including most goals and points (Marian Gaborik – 42 goals and 83 points). Also, Jacques Lemaire recorded his 500th career coaching win as the Wild clinched their first ever Northwest Division title in a 3–1 victory over the Calgary Flames on April 3, 2008. They again faced the Colorado Avalanche in the first round as sixth and third seed (as in the 2003 playoffs), but this time the roles were reversed, and the Wild held home-ice advantage. However, Minnesota came up short, being eliminated in six games by the Avalanche. During the 2008 off-season, the Wild re-acquired Andrew Brunette from Colorado and traded for defenseman Marek Zidlicky. The Wild also signed free agents Antti Miettinen and Owen Nolan to multi-year deals. There seemed to be a stigma about Jacques Lemaire's defensive system that caused a number of top free agents to avoid the Wild. Despite winning the Northwest Division the previous season, the Wild fell to ninth place in the Western Conference in 2008–09, missing the playoffs. Much of this was in part due to a lack of scoring and overall team offense, and the injuries to star forward Marian Gaborik, who only played 17 games. 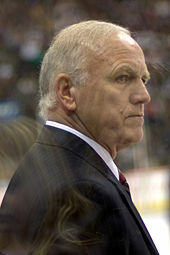 Jacques Lemaire, head coach of the Wild since the team's inception in the 2000–01 season, resigned at season's end. General manager Doug Risebrough was later fired, leading to a nearly complete turnover in the Wild's coaching and hockey management staff. In the 2009 off-season, Marian Gaborik signed with the New York Rangers during the summer as a free agent. Team owner Craig Leipold hired former Pittsburgh Penguins assistant general manager Chuck Fletcher as general manager. Later that summer, Fletcher selected Todd Richards as head coach. Martin Havlat was signed via free agency after playing the previous three seasons for the Chicago Blackhawks in order to lessen the blow of Gaborik's departure. 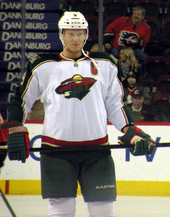 During the first month of the 2009–10 season, the team announced their first ever full-time captain, Mikko Koivu. In 2009, Leipold named Matt Majka as chief operating officer of the team. The 2009–10 and the 2010–11 seasons ended in disappointment for the Wild as they missed the playoffs both seasons. In the 2010 NHL Entry Draft, the Wild held the ninth overall pick and used it to select Finnish forward Mikael Granlund. The Wild opened the 2010–11 season with two games at the Hartwall Areena in Helsinki against the Carolina Hurricanes. Following the 2010–11 season, the team fired head coach Todd Richards due to the team failing to reach the playoffs in his two seasons as head coach with a 77–71–16 record. Mike Yeo, who coached the Wild's AHL affiliate Houston Aeros to a Western Conference title in 2011, was named the new head coach. During the 2011 NHL Entry Draft (which the team hosted), the Wild used their tenth overall pick to select Jonas Brodin. The club also created a stir when they traded star defenseman Brent Burns and a 2012 second round pick to the San Jose Sharks in exchange for Devin Setoguchi, Charlie Coyle and the 28th overall pick in the 2011 draft, which they used to select Zack Phillips. Later in the off-season, the Wild traded Martin Havlat for Dany Heatley in another blockbuster trade with the Sharks. In November, the team set a franchise record for most wins in one month with 11. Despite a hot start to the season that saw them sitting atop the NHL standings in early December, multiple injuries to key players for extended periods effectively eliminated the team from playoff contention for the fourth consecutive year. During the 2012 off-season, the team was able to sign top prospect Mikael Granlund to a three-year, entry-level contract. During the 2012 NHL Entry Draft, the team selected Matt Dumba with the seventh overall pick. In the same off-season, the Wild also signed unrestricted free agent winger Zach Parise, a Twin Cities native, and defenseman Ryan Suter to identical 13-year, US$98 million contracts. However, the team's busy off-season was overshadowed by the 2012–13 NHL lockout, which ended in January 2013. Zach Parise (left) and Ryan Suter (right) during the 2012–13 season. Both players signed identical 13-year contracts as free agents during the 2012 off-season. Prior to the 2013 trade deadline, the Wild acquired Jason Pominville from the Buffalo Sabres in exchange for prospects Johan Larsson and Matt Hackett, as well as draft picks. The team reached the post-season for the fourth time in franchise history after a 3–1 win over the Colorado Avalanche on April 27, 2013. Finishing eighth place in the Western Conference, the Wild lost in five games to the eventual champions Chicago Blackhawks in the first round of the 2013 playoffs. The relocation and rebranding of the Atlanta Thrashers as the "new" Winnipeg Jets in 2011 meant Winnipeg was once again Minnesota's second-closest geographical rival after Chicago, and led the NHL to reconsider its divisional alignment. Even before the NHL's return to Winnipeg, Wild management had lobbied repeatedly for a move out of the Northwest Division, where they were the only Central Time Zone team. Among the alignments considered was having the Jets replace the Avalanche in the Northwest, but Wild management strongly objected to this alignment as it would have left them as the only American team in their division. Following protracted negotiations both amongst the owners and with the National Hockey League Players' Association, in 2013, the NHL collapsed its six divisions into four and dissolved the Northwest Division. Consequently, the Wild moved into the Central Division along with the Jets and Avalanche; the Canadian teams from the Northwest moved back to the Pacific Division. The Wild now share their division with not only the Blackhawks but also the Dallas Stars, the Wild's predecessors in Minnesota, and the St. Louis Blues, another major rival of the North Stars during the Norris Division era. Thus, the 2013 Blackhawks–Wild playoff series was seen as the rebirth of the old Chicago–Minnesota rivalry in the NHL. The 2013–14 regular season for the Wild was the best the team had since the 2007–08 season, good enough to claim the first Wild Card position. Jason Pominville became the Wild's third player in franchise history to reach the 30-goal mark, with Mikko Koivu surpassing Marian Gaborik in all-time points for the club. The Wild battled goaltender problems throughout the entire season. It began with Josh Harding leading the NHL in save percentage, and goals against average, before being placed on injured reserve for complications with his Multiple sclerosis (MS). Niklas Backstrom also suffered a season-ending injury with abdominal issues. The Wild started five different goalies during the year and dressed seven. At the trade deadline, general manager Chuck Fletcher acquired Ilya Bryzgalov from the Edmonton Oilers in exchange for a fourth-round pick, as well as Matt Moulson and Cody McCormick from Buffalo in exchange for Torrey Mitchell and two-second-round picks in 2014 and 2016. In the playoffs, the team would face Colorado, who won the Central Division. The Wild won the series four games to three with an overtime goal in Game 7 by Nino Niederreiter. The team would then face the defending Stanley Cup champions Chicago, where they were eliminated in six games. During the 2014 off-season, the Wild signed forward Thomas Vanek as a free agent. In 2015, the Wild clinched the first wild card spot in the West by defeating the Chicago Blackhawks. They then defeated the Central Division champions, the St. Louis Blues, in the first round of the playoffs in six games. In the second round, the Wild were eliminated in a four-game series sweep by Chicago. Following the loss, forward Matt Cooke said, "Our expectations inside this room were a lot higher than [a] second round series." In 2016, the Wild set a franchise record with the best win record in the first 41 games of the season. Immediately afterward, they went into a skid, losing the next 13 of 14 games, culminating in the firing of head coach Mike Yeo. Under new interim head coach John Torchetti, the team snapped the losing streak but remained streaky throughout the rest of the season, managing to barely make the playoffs with a total of 87 points, the worst record of any playoff team in the shootout era (since 2005–06). In the first round, the Wild fell to the Central Division champion Dallas Stars in six games. During the 2016 off-season, the Wild signed free agent Eric Staal to a three-year contract. The Wild also hired Bruce Boudreau as their new head coach, replacing interim head coach John Torchetti. In 2017, the Wild set their new franchise record for points (106), wins (49) and goals for (266). The Wild set a franchise record 12-game win streak that was snapped on New Year's Eve 2016 by the Columbus Blue Jackets, a team also on a franchise record win streak at the time. Nevertheless, Minnesota failed to win more than a game in the playoffs, losing in five games to St. Louis. Mikael Granlund led the team in points with 69, while new addition Eric Staal led the team in goals with 28. Mikko Koivu was a finalist for the Frank J. Selke Trophy for best defensive forward, while Granlund was a finalist for the Lady Byng Trophy. In the 2017 off-season, the Wild experienced significant roster turnover. Erik Haula was lost to the Vegas Golden Knights in the expansion draft (along with prospect Alex Tuch). Winger Jason Pominville and defenseman Marco Scandella were traded to the Buffalo Sabres in exchange for forwards Tyler Ennis and Marcus Foligno. Minnesota native Matt Cullen was signed as a free agent and returned to the Wild to shore up the fourth line (Cullen had previously played in Minnesota from 2010–2013). Captain Mikko Koivu signed a two-year extension, ensuring he will remain with the Wild through the 2019–20 season. Following another 100-point regular season, the Wild matched up with Central Division rival, the Winnipeg Jets, in the first round of the 2018 playoffs. The Jets defeated the Wild in five games, making it three straight seasons in which the Wild failed to advance past the first round. On April 23, shortly following the Wild's exit from the playoffs, owner Leipold announced he had fired general manager Fletcher after nine seasons with the team. Under Fletcher's leadership, the Wild qualified for the playoffs six consecutive years, but failed to advance beyond the second round. For their first seven years in the NHL, the Wild wore a uniform of either a green or white jersey with red and gold stripes and the primary logo on the front of the jersey. The shoulder patch was a circle with "Minnesota Wild" read in distinctive lettering from both words. The name and numbering on the green jersey would be gold with red outlining while on the white jersey it was red with gold outlining. In 2003–04, with the NHL reversing the convention regarding the home and road jersey colors, the green jersey became the home jersey while the white one became the road jersey. In the 2007–08 season, when all jerseys were converted to the new Reebok Edge uniform system, the white jersey was retained and the home jersey replaced with a new one that has a small imprint of the team's primary logo inside a white circle, which is surrounded by the words "Minnesota Wild" in a larger ring against a green background. The rest of the jersey is predominantly red, with additional swatches of green on the sleeves. This jersey was originally unveiled as the Wild's alternate jersey in 2003. The away jersey uses a larger version of the primary logo without the concentric circles on a predominantly white jersey; in 2013, the lettering was updated to match the home and alternate sweaters, at the same time updating the sweater's look to a more traditional design. On August 30, 2009, the team unveiled another third/alternate jersey, which is predominantly green with wheat accents. It says "Minnesota Wild" in script writing across the chest. On April 4, 2017, the Wild honored the Minnesota North Stars by wearing North Stars jerseys for warmups, despite the North Stars history belonging to the Dallas Stars. Martin Hanzal warmed up with number 91, as the North Stars retired number 19 in honor of Bill Masterton. On June 20, 2017, the Wild introduced a new home uniform, as the NHL switched from Reebok to Adidas – a green jersey with their main logo, and a wheat colored stripe through the center of the jersey. On the arms is a wheat colored stripe with a smaller red stripe near the top of it. The Wild kept their away jersey design the same. The Wild, along with the rest of the NHL, did not have an alternate jersey for the 2017–18 season. The team has always had a goal horn since its inception. The team's first song was "Rock and Roll Part 2" which was used from its inception in 2000 to around 2006. The second song used after that was "Crowd Chant" by Joe Satriani. After pop legend and Minneapolis native Prince died in April 2016, the team had a tribute to him at Game 6 of the 2016 Stanley Cup playoffs game against the Dallas Stars, the team used "Let's Go Crazy". After a fan poll, the team permanently used "Let's Go Crazy" after the goal horn starting in the 2016–17 season. The Wild kept "Crowd Chant" as their win song. In the 2018–19 season, the team brought back the "Crowd Chant" as its goal song. Alternate logos used by the Wild. The word mark logo (left) was used from 2000 to 2010. The logo with the 'wild animal' inside a circle (right) has been used as an alternate logo since 2003. The logo depicts both a forest landscape and the silhouette of a wild animal. The "eye" of the "wild animal" is the north star, in tribute to the departed Minnesota North Stars as well as the states motto L'Étoile du Nord, meaning "The Star of the North". According to The Good Point, questions surrounding the identity of the animal depicted has sparked debate amongst logo enthusiasts, earning accolades for its complexity unique to North American professional sports. In 2008, "Nordy" was introduced as the official mascot of the team. The franchise was originally owned by a limited partnership formed by former majority owner Bob Naegele, Jr. of Naegele Sports, LLC in 1997. On January 10, 2008, it was announced the franchise was being sold to former Nashville Predators owner Craig Leipold. The NHL's Board of Governors officially approved Leipold's purchase of Minnesota Sports & Entertainment (MSE) on April 10, 2008. Leipold, a resident of Racine, Wisconsin, completed the sale of the Nashville Predators to a local ownership group on December 7, 2007, a team he owned since the expansion franchise was awarded to Nashville in 1997. Leipold is the majority owner and principal investor in MSE, a regional sports and entertainment leader that includes the NHL's Minnesota Wild, its AHL affiliate the Iowa Wild of the American Hockey League, Wildside Caterers, 317 on Rice Park and the facility management of Xcel Energy Center and the Saint Paul RiverCentre. He also serves as the team's Governor at NHL Board of Governors' meetings. After purchase of MSE, Mr. Leipold sold the Swarm to John Arlotta. Along with the Wild, the group has year-round management rights of the Xcel Energy Center, and currently has a management contract to manage the adjoining Saint Paul RiverCentre and Roy Wilkins Auditorium. The partnership also owns and operates 317 on Rice Park, which is the former historic Minnesota club. The Minnesota Wild stay involved in the community through the philanthropic activities of the Minnesota Wild Foundation and its operations to support the game of hockey with events such as Hockey Day Minnesota. It has been celebrated every year since 2008. The Wild are 8-2-1 on Hockey Day Minnesota. Started in 2017, the Wild unveiled a new tradition called This Is Our Ice which encourages Wild fans to bring water from local ponds, lakes and rinks and add it to the Xcel Energy Center ice. Fans can bring water to any regular season home game and add it to the collection station which will then be added to the ice for the season. Note: The Wild rotated the captaincy for their first nine seasons on a monthly basis among several of its players each season, with some players serving multiple times under Jacques Lemaire. 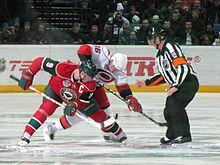 After Todd Richards became head coach for the start of the 2009–10 season, Mikko Koivu, who was the last rotating captain and has had the captaincy three different times in the 2008–09 season, became the franchise's first permanent captain on October 20, 2009. Hall of Famers: The Wild's former head coach Jacques Lemaire was inducted into the Hockey Hall of Fame (in the players category) in 1985. On April 3, 2008, he became only the 11th coach in NHL history to have 500 wins. The following are the top-ten franchise point-scorers as of the end of the 2017–18 season. Recording 659 points as a member of the Wild, Mikko Koivu is the franchise's all-time point leaders. Niklas Backstrom holds the franchise record for most wins, winning 194 games as the Wild's goaltender. Minnesota currently has one minor league affiliates the Iowa Wild of the American Hockey League (AHL). The Iowa Wild are owned by the parent club, who relocated the franchise from Houston in 2013. ^ "Team Identity" (PDF). 2017–2018 Minnesota Wild Team Guide. NHL Enterprises, L.P. September 21, 2017. Retrieved September 29, 2017. ^ "Minnesota Wild Unveils New Jerseys for 2017-18". Wild.com. NHL Enterprises, L.P. June 20, 2017. Retrieved May 8, 2018. ^ "Origins of the 30 NHL Teams". National Hockey League. 2008. Archived from the original on 2008-04-08. Retrieved 2008-04-26. ^ "Jack Sperling Bio". National Hockey League. 2007. Archived from the original on 2008-01-08. Retrieved 2008-04-26. ^ "Risebrough's Bio". National Hockey League. 2008. Archived from the original on 2008-10-06. Retrieved 2008-04-26. ^ "NHL mourns passing of Zholtok". Archived from the original on 2008-05-14. Retrieved 2008-04-25. ^ McCoy, David (2015-05-11). "After Playoff Exit, Wild GM Says Improvement Must Come From Within". CBS Minnesota. Retrieved 13 May 2015. ^ "Minnesota makes a Wild run to NHL playoffs". stltoday.com. Associated Press. Retrieved 2016-04-28. ^ "Recap: Stars nearly blow 4-goal lead, but escape with 5-4 win to advance to second round | SportsDay". SportsDay. 2016-04-24. Retrieved 2016-04-28. ^ Daddy, Puck. "Blue Jackets Victorious in Unsustainabowl". Yahoo!. Retrieved 2017-10-03. ^ "Wild General Manager Chuck Fletcher is fired". Minneapolis Star Tribune. April 23, 2018. Retrieved April 23, 2018. ^ "Minnesota Wild Unveils New Jerseys for 2017-18". National Hockey League. June 21, 2017. Retrieved June 22, 2017. ^ "Minnesota Wild switching to Prince for their goal song". ESPN. April 23, 2016. Retrieved March 13, 2018. ^ "'Crowd Chant' returns as Wild's goal song in 2018-19". NHL.com. October 4, 2018. Retrieved November 15, 2018. ^ "Team Identity" (PDF). 2017–2018 Minnesota Wild Team Guide. Minnesota Wild. 2017. p. 10. Retrieved May 1, 2018. ^ Larkin, Matt (August 8, 2014). "NHL logo rankings No. 11: Minnesota Wild". The Hockey News. Retrieved May 1, 2018. ^ Kent, Austin (December 22, 2008). "Bears eat Beets: The Minnesota Wild Logo Essay". The Good Point. Retrieved May 1, 2018. ^ "wild.nhl.com/team/app?articleid=360027&page=NewsPage&service=page". Archived from the original on 2008-10-12. ^ "Wild Unveils New 'This Is Our Ice' Tradition". National Hockey League. August 24, 2017. Retrieved March 12, 2018. ^ "This is Our Ice". National Hockey League. Retrieved March 12, 2018. ^ "Minnesota Wild Roster". NHL.com. Retrieved August 1, 2018. ^ "Minnesota Wild Hockey Transactions". TSN.ca. Retrieved August 1, 2018. ^ "Wild AHL Affiliate Moving To Iowa". Minnesota Wild. 2013-04-18. Retrieved 2013-04-18. ^ "Wild Announces Affiliation With Quad City Mallards". National Hockey League. July 21, 2015. Retrieved March 13, 2018. Wikimedia Commons has media related to Minnesota Wild.